Today we are going to look at 12 houses that were homes and landmarks in Newark between 1750 and 1850. Last week we examined some earlier buildings along Broad Street and the township's outskirts. This week we'll look at a mid-point in the city's architectural history, showing us, as we will detail in the coming weeks, how our housing patterns changed. From 1747 to 1757, the Aaron Burr Parsonage of Old First Church was used by Rev. Aaron Burr, father of the future vice president and second president of the College of New Jersey, later Princeton University, as a training place for Presbyterian ministers and local leaders. After the college and the Burrs left for Princeton, it was occupied by Rev. Alexander Macwhorter, the church's well known Revolutionary War era minister. Within its walls, he entertained Gen. George Washington and other military leaders including Gens. Knox and Livingston. The building was a simple two-story wooden-frame Georgian-style structure four steps up from Broad and William streets. It had a central door flanked by two large windows and five windows on the second floor, enhanced with black or green louvered shutters. It was razed in 1835. 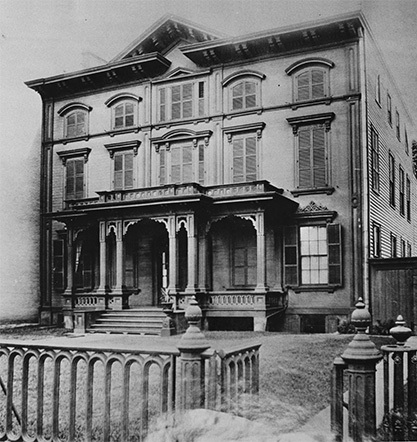 The Benjamin Coe homestead at Court and Washington streets stood near the site of The Star-Ledger building. During a British raid, it was destroyed and the contents ravaged. Fortunately, some of its valuables, including a bag of gold, was hidden in the weeds, and its cattle scattered in the Orange mountains before the attack took place. The loss to the Coe family was reported to have been more than $130, a considerable sum for any calculator of colonial fortunes. Years later the building was rebuilt and stood well into the present century when a commercial structure was erected on the site. ''Perhaps the grandest house in all of Newark was the Boudinot Mansion,' according to an account of the city's history. It was the home of much-admired Judge Elisha Boudinot and his son, Major Boudinot. As a place visited by Gen. Lafayette in 1824, it was considered one of the most important buildings in the center of town. The mansion extended from Park Place on Military Park all the way back to the Passaic River and included a beautiful rear garden house. Its owner was an elder in Old First church. Mrs. Boudinot, with other 'establishment ladies' of town, founded the Newark Female Charitable Society at the house in 1803, during the administration of Thomas Jefferson, making it one of the nation's oldest social welfare agencies. One historian gave this description: 'From its windows one might look out upon the river and the bay and upon a smiling open country in almost every direction, but for many years buildings have jostled it on every side save from the front. From his front porch Judge Boudinot sat and looked out upon the new generation fighting sham battles, and at every evening watched the fireworks, aglow with patriotism at the very end of his long and noble life.' The main house was built of brick said to have been imported from England, and its exterior walls were painted brown, with a darker brown trim and green shutters. Its interior was once described as 'probably the most pretentious in the city' and included French furnishings along with some of the finest Newark-made furniture. The building was 54 feet wide, 48 feet deep and well proportioned. A kitchen wing with a Dutch oven was attached at the north of the house, and the south wing included the judge's law office. Behind the main structure was a garden and orchard. Beyond that point, the open country sloped gently to the little bluff along the river. One historian noted: 'In the garden visited men of prominence, some with country-wide reputations …, to devise ways and means for the advancement of Newark and the state at large.' After the Boudinots were gone, the building served briefly as a girls' school. It was demolished in 1913 and is commemorated today by a historical marker. The Alling House at Broad and Fair (later Lafayette Street) is a good example of more commercialized Newark building following the Revolutionary War era. Gone or almost gone were the original settlers' lots, and the city, especially along Broad Street, where a solid row of buildings was separated only by street corners. Built about 1790, the Alling House was both commercial and residential in nature. For more than a century, it represented a typical American city building combining work place and residence. In later years the Ballantines lived at their brewery. Even in this century, dry goods store owners frequently lived over the shop. Two paintings of the Alling store and home can be found at the Newark Museum and the New Jersey Historical Society. It was here, according to one report, that David Alling made 'the most beautiful sofa and most elegant sideboard of an entirely new pattern' for Judge Boudinot for Lafayette's visit in 1824. The hospitable front door of the Alling House seemed always to be open and guests welcome. Visitors entered through a great center hall and saw a staircase that led to sleeping rooms above. To the left one entered the building's parlor and in the back was the bedroom of the owner. The rooms to the right included Mr. Alling's showrooms and a factory for the manufacture of his famous chairs. The house was a story and a half tall, had high ceilings and a stone courtyard in the rear. Following David Alling's life the building was brought by Stephen Alling, who never lived in it. Right around the corner from the Alling house, factory and showroom, was the Caleb Wheeler homestead, built around 1796, and intended solely for resident and farm purposes. Described in the 1865 Newark Daily Advertiser as an 'ancient landmark,' it was at Market and Mulberry streets at a time when the site was 'occupied with forest and the resort only of beasts of the wood' and when 'nearby country homes stocked the harvest of the field and the orchards. Farmers thought nothing of cellaring their two hundred barrels of cider each season.' So small was old Newark that an 18th century homestead stood less than a few blocks from a manufacturing establishment. Three early 19th century Newark period houses that have undetermined construction dates include the Phillips Farm of Woodside, the Frelinghuysen Mansion on Broad Street and the Ward family holdings along West Back Street, now Washington Street. Each was very different, important to its community, but built about the same time. The Phillips Farm was located on Summer Avenue midway between Chester and Delevan, when the site was 'purely a farming district, whose inhabitants went elsewhere for their groceries and religion, and as the average farmer thinks more of making hay than history…' Phillips' love of the area resulted in planting many trees and he encouraged others to the same, giving it a New England-type environment. Upon his death the farm was sold, his descendants moved to the shore and the area changed from an agricultural to a residential community. The Frelinghuysen Mansion at Park Place and Canal Street was built by one of Newark's and New Jersey's most politically astute families. When Theodore Frelinghuysen married Charlotte Mercer, the house was given as part of the wedding dowry. The gift included land directly east of the old flag stand at the foot of the commons, and adjoining the Morris Canal. The house was later occupied by Proctor's Theatre, and finally by the Fox Terminal Theatre. In 1833 when Henry Clay visited the Frelinghuysens he said that he had come 'to shake hands with you and become better acquainted, and if you please to take a chew of tobacco with you.' Frelinghuysen unsuccessfully ran as a vice presidential candidate with Henry Clay for president of the United States. Along Washington Street, once West Back Street, the property-owning Ward family controlled most of the land that the library, museum, and law school now occupy. The old Ward farmhouse and later Victorian mansion gave way to the Newark Public Library in 1901. The gracious Marcus Ward Mansion became the site for the Newark Museum in 1926. The Symington house, built in 1808, at 2 Park Place, behind Trinity/St. Philip Cathedral, is a worthy example of the fine townhouses that were built in Newark's 19th century silk stocking districts, which included not only Military, but Washington and Lincoln parks, and a good portion of High Street. Today, 2 Park Place remains, but the house at 6 Park Place has disappeared. Both once belonged to the Symington family. Originally built as the rectory for Trinity Church, they were sold because they were too large, and apparently too expensive, for church purposes. No. 2 Park Place was built in 1808 and No. 6 sometime between 1836 and 1838. Their exterior wails were 18 inches thick and every room boosted its own carved mantel. Solid mahogany mantels were found in the front parlors and the library. In the 19th century, additional bathrooms were installed with three-inch thick porcelain tubs encased in oak frames. Robert S. Symington was the father of C. Clark Symington, secretary of the nearby Clark Thread Co. He brought his young bride to the mansion, their first home. While the third floor was reserved for servants quarters, the downstairs public rooms were filled with hand-carved Newark-made tables, chairs, sideboards and built-in corner cabinets with leaded glass windows. The two Park Place houses were purchased in the 1960s. While No. 6 was demolished, No. 2 served as headquarters of the city's 300th anniversary celebrated in 1966. Later it became an office and training center for fast-tracked local CEOs and executives. In recent years, it has been reacquired by the Episcopal Diocese of Newark, and for awhile was home to St. Philip's Academy. Today it serves as a reminder of Newark's opulent architectural legacy. In 1823, today's Clay Street was considered the north end of town. It is there that German immigrants George Rohde and his nephew Charles Stoudinger built a home that was to stand until 1918. Rohde was an engineer who came to this part of the world to attend to engineering needs of the old Schuyler copper mines in North Arlington. Stoudinger went to work helping Robert Fulton build the first successful Hudson River steamboat. The area where Stoudinger built his home was on the site of Newark's first grist mill in the 17th century. Later, it was referred to as the Old Stone Bridge section because of a bridge that crossed First River before it flowed into the Passaic River near the present-day Clay Street bridge. The original property occupied a 100 by 227-foot lot at Broad and Clay streets. The house built on it was frame, surrounded by an elaborate wooden picket fence, and its exterior was made of wide clapboard. It had four large flanking chimneys and a square central tower or cupola complemented by dormer windows and wooden porches. The main floor was raised high above the basement level and there was a pediment over the front entrance. There were two flanking windows on either side of the front door, and the overall style might have been best described as eclectic, or Italianate. A heavily detailed cornice separated the building's upper walls, from the roof line. Early in the century, Newark librarian John Cotton Dana unsuccessfully championed the sparing of the house from demolition as well as the old Center Market Place and the Marcus Ward home. Unfortunately, none of these buildings survived. In the case of the Stoudinger House, death, high living and an inability to deal with financial realities of the day resulted in the diminution of the family fortune and the eventual loss of a financial base to support the building or even keep the family together. In 1919, the building faced the wrecker's ball. By 1850, protests were being heard that some of the city's architectural splendors were being lost to history. When the south end home of Dr. Isaac M. Ward at Lyons Farms was incorporated into Weequahic Park, a newspaper reporter lamented, 'The march of progress knows no sentiment nor regret; giant trees, which have been ages coming to their wonderful beauty, fall by the wayside, and old homesteads are swept away, with a pang, to make way for modern things.' The Isaac Ward home, described as having 'sheltered the climbing vines, with its abundant shrubbery, and majestic trees, ' also was about to disappear. Sound familiar? Well, hundreds of buildings have disappeared since then and the fight isn't over yet as the struggle to save some of Newark's architectural past for the present and future remains a daily challenge.